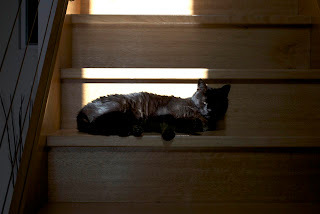 This is a good spot to sleep in on a sunny day. Everyone going up and down the stairs has to step over me. That's the way it should be - the world revolves around me. There I was, sitting at the top of the stairs, minding my own business, when the pupparazzi arrived. So I refused to look directly at them. Don't ask me where Bazza was, he has done a lousy job of being my bodyguard since you all voted him in. Maybe he needs some more training? Remember I said a long time ago that I never get on the kitchen table? 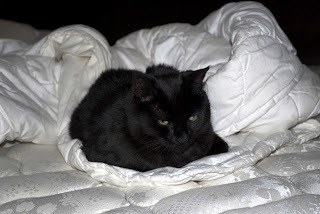 Well lately, I have been climbing up there to help mum with my blogging. She doesn't even complain or anything! Well, not that I listen to anyway. I'm a cat and an honorary husky - I do what I like. 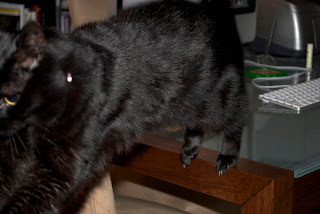 Anyhow, I was sitting on the edge of the table and mum was going to take a photo of me but I jumped! 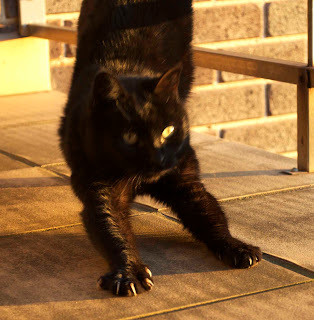 I was leaping for the couch and mum got this action shot of me. My back paws are still on the edge of the table and the rest of me is in the air! I could join the circus or something. Today I'd like to share with you some of the other entries from the Happy Hearts competition. It's a shame we couldn't give a prize to everypup and everykitty, really. 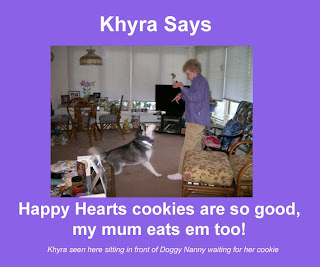 Khyra said: I think HH cookies will....help ME to get more boyfuriends! 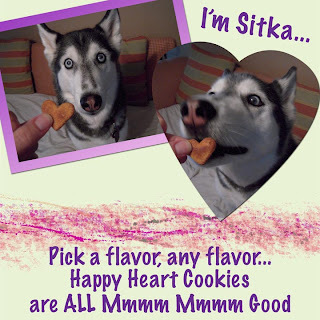 Evfurryone knows the way to a man's heart is through his stomakhh! I lure them to Khyra's Khorner and let them try my Happy Hearts! THAT soooooo hooks 'em! 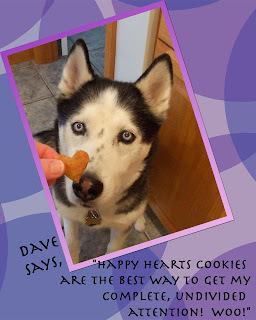 Cliff and Olivia said: We think happy hearts cookies will help us to bribe the humans to give us more treats and cuddles. My new friend Gibson Turnbull said: "I think Happy Heart cookies will help me to have an even bigger and happier heart than I already have! 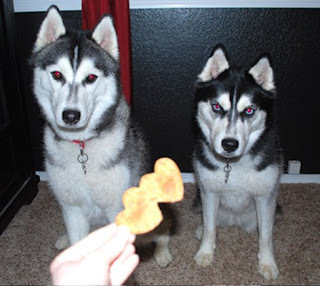 I think Happy Hearts cookies will help me learn to love to share with my brother Benson." I'll share some more entries later. But you can see how Zim and I had some very tough decisions to make! This is my new cousin, Chloe. Isn't she a cute little thing? She has a very floofy tail! Mum hasn't let me meet her yet, as she hasn't had all her shots and things. She's about 12 weeks old in this picture. Mum said she's a sweet little kitty, who likes to play with all the laundry on the line and pull it on the ground. What a girl! 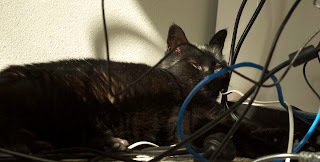 On a sunny Sunday morning, I help dad by sitting on the wires that plug into his computer. I think he finds it very useful. My dear friend Ginger Jasper tagged me during the week to play the game of things I have never bought. Since I have never been shopping, I am going to make mum do this meme. I make her buy all my food and toys anyway, and she knows her way around a shop, let me tell you. Okay mum, tell them what you've never bought. 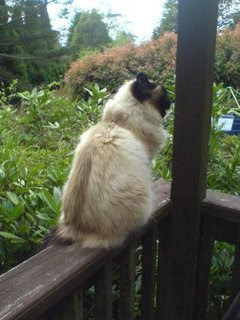 A cat, until I bought Huffle Mawson for her dad as a Christmas present. Okra. I see it in the shop but I have no idea what to do with it. A pen. I get them all from work! It's Friday the weather has been a tiny bit warmer the last two days - we've actually made it to 20 deg C! 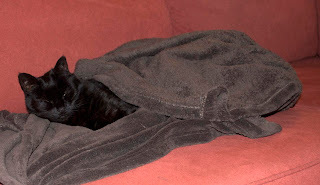 But the forecast for the weekend is for colder weather again so I'll be doing a lot of sleeping on the toast couch blanket, maybe even under the toasty couch blanket. Happy Friday everypup and everykitty! If you steal dad's spot on the couch, he won't make you move. If you look all cosy, mum will take photos but won't make you move. If you pretend to look cold, dad will put the heater on for you but won't make you move. 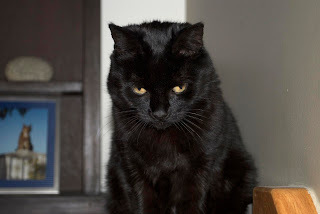 If you give your mum an evil look, she will go away and will not make you move. It seems to have come around faster than I could have imagined but today is my 400th post! Can you believe it? Mum and I never thought we'd get this far! 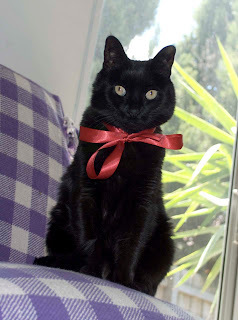 I decided today should be a celebration so I have the red ribbon out again. I hope every pup and kitty has a wonderful day and if any of you want to come over, we'll have a party! One last thing, I'd especially like to thank Turbo who was the very first pup to comment on my blog. I felt so happy that day! Get the popcorn ready, pups and kitties! For your viewing pleasure, here is a short movie of me playing with my new purple wubba. I don't know what made me jump at the end, but I love my new wubba. 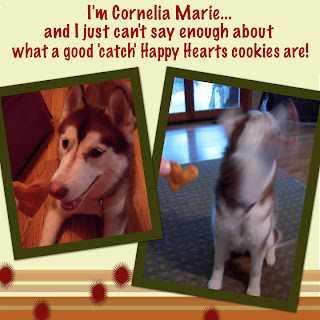 Yes, pups and kitties, it's time to announce the winner of the Happy Hearts cookie competition! I had some excellent entries and it was really hard for Zim and I to come up with just one winner, so we chose two! Dante Kitty, who said, I think happy hearts cookies will help me to..... be the baddest kitty in all the world. Zim and I wanted to give an honorable mention to Stella, who said, I think Happy Hearts cookies will help me to be smarter, more noble, more willing to spend time learning tricks, more willing to wipe my feet when I come in the house after it rains, more handsome, more patient with my cat, more willing to be better at the groomers, more taller, and for these reasons I can't wait to win this Happy Hearts contest. If the three of you could please email me your addresses, and tell me what flavour cookies you would like to try, I'll have them sent to you very soon! Check out the Happy Hearts website to make your choices. Thank you to every pup and kitty who entered. I'll feature some more entries during the week. Don't forget to visit Happy Hearts and think about ordering some for yourself! And thanks to Zimmie who helped me with the judging! One day last week, mum and dad were standing near the front door talking. Dad was about to go out and he had already opened the front door. While he was talking to mum, I saw my big chance and I ran as fast as I could from the other end of the house and out the door! I made it all the way to the front lawn (no grass, just weeds) before dad realised that the black blur he saw was me. He ran outside and chased me back in the house. Then mum and dad shut the door and laughed and laughed. I wasn't laughing. They totally ruined my fun. My Huffle Duffel has arrived! Look, here it is! My best friend Zim's mum makes bags and things and I asked her to make me a Huffle Duffel (which was named after me, how cool is that?) for me to keep my mouses in. It got delivered this week! But look what was inside! Zimmie sent me some presents! This one is a kitty wubba, which has a bell inside and the legs make a crinkly noise when I attack them. It's very cool. Mum already has a video of me playing with this, I'll show you that soon. 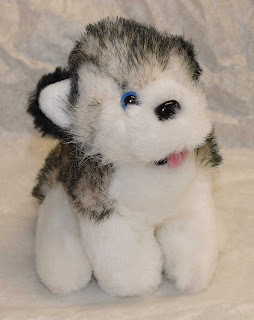 This is a little Siberian puppy! Zim wrote me my very own card and part of his message said that maybe the puppy could step in for Bazza if I need a new bodyguard. I think that's a great idea. Now we just have to think of a name for the puppy. I want to call it Zim but mum thinks she might get confused. What do you think? 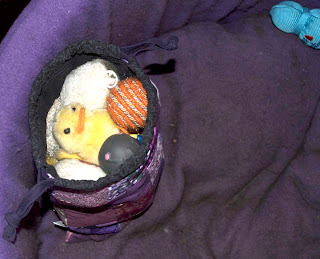 Here is my Huffle Duffel sitting inside my purple Huffle bed, stuffed with all my mouses, including the mousefish and the mouseduck. It's the perfect size. And look, this is the card that Zim wrote to me. 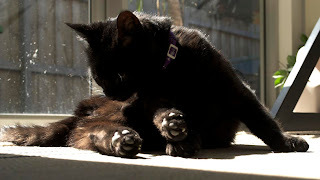 He has very nice pawmanship, I must say. He said it was a cool bug on the front and I have to agree! If we lived in the same country we could get together and chase bugs! Then have some catnaps. Thank you Zimmie and Mum-o-Ao4! 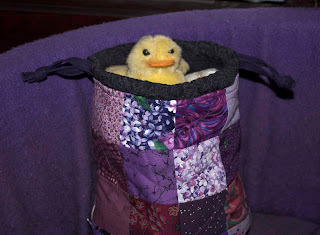 I love my Huffle Duffel and my presents! I showed you a photo last week of my old purple collar with the fishes on it. That collar was very old, I had it from nearly the day I arrived here over three years ago. 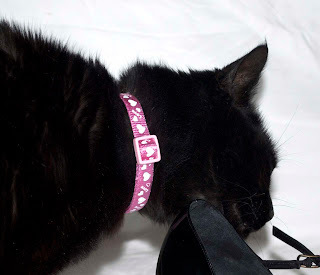 On the weekend, mum decided to buy me a new collar! This one is pink with little hearts all over it, and it says LOVE. I think this means mum and dad love me. Which is good. You can click on the photo to see it up closer if you want. Oh, and that photo is from when mum was trying to take photos of her new shoes, and I was snoopervising her. I'm very helpful like that. 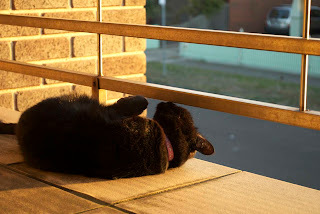 On the weekend, when it was sunny, I had to sleep wherever the sun was. This is me in the hallway upstairs outside the bedroom with MY bed in it. About an hour later, I had to move closer to the door to follow the sun. Position is EVERYthing when it comes to being toasty. And you know what that means. I have to be toasty! 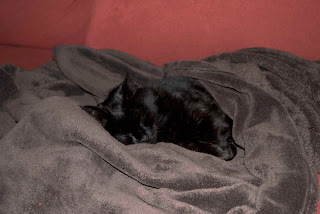 I started the toasty campaign on the weekend by stealing dad's toasty couch blanket. It's very toasty. He had to go sit somewhere else. My lovely friends Cliff and Olivia shared this award with me over the weekend. My friend Daisy (sister to Tucker and Leo) is having a special contest to celebrate her birthday. She would like to meet some new blogging friends so I am supposed to introduce you to some of my blogging friends who are new to the world of blogging. This is my friend Batu Khan. 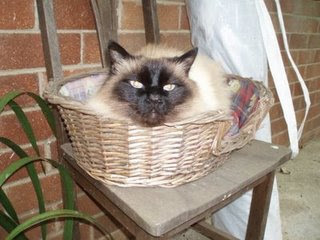 He is a Birman cat who lives in the Blue Mountains in New South Wales, Australia. He's only about 900km from me! In Australia, that's close by. Doesn't he have the most incredible view from his balcony? We don't have anything that green in my backyard, that's for sure. Anyway please go and visit him and say hello. Also, it's mother's day today so happy mother's day to my mum, and to all the mums of pups and kitties and people out there! And don't forget to enter the competition! Sunday is the last day! 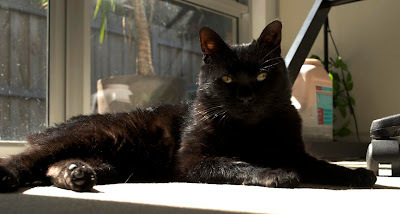 Cats with Blogs now has 120 members! How fantastic. But I know there are lots more cat bloggers out there who still have to join. Come on everycat, we need to beat the dogs! 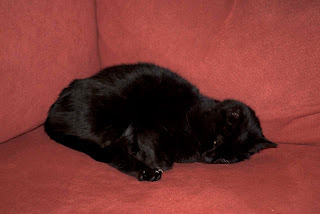 And of course, interviewing Gerri was pretty tiring so I needed a lot of naps before, during and after the interview. Don't forget to enter the competition! I realise some of you may not be able to use the link to my email address so here it is properly: hufflemawsonATgmailDOTcom . I think you know what I mean. Did you miss seeing a picture of me this week? Here I am! Happy Friday everypup and everykitty! I hope you all read the interview with Gerri on Tuesday and Wednesday! It was very informative, wasn't it? Anyway it's time for the competition I promised. You have to complete the following line: "I think happy hearts cookies will help me to...". 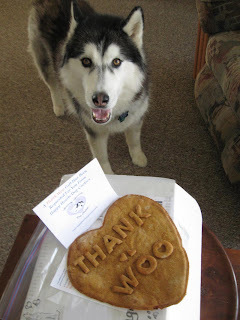 For a bit of inspiration, here's a picture of Jack-a-Roo with his giant Happy Hearts thankyou cookie cake! Please email your entry to me. You have until midnight Sunday to get your entry in. Unfortunately, this competition is only open to pups and kitties in the USA at the moment. The winning entry will get a sampler pack of cookies, in your choice of flavours. I'll have my best friend Zim help me with choosing the winning entry, so you know I won't be biased. It's up to you to get creative, everyone! And don't forget to visit Happy Hearts Cookies! Today we continue our exclusive interview with Gerri from Happy Hearts Cookies! HM: How long does it take for the cookies to arrive, once they’ve been ordered? GD: I usually start working on them the day after they are ordered, some orders take me 3 days to make, and when I receive payment, I ship the cookies out. How soon you receive them depends on where you live and how far they have to be shipped. On an average, I would say about 5 days after I receive your check, if not sooner. It only takes longer if the evil squirrels highjack the delivery truck. We had this incident happen not long ago on an order going to Washington State and someone they ended up on a truck to Georgia. It was very traumatic for our friend Steve, and his sister Kat broke this story. HM: How do you send them? GD: I ship them UPS or FedEx. Unfortunately the postal service is not very dependable. HM: Do you bake every batch fresh? GD: YES!!! If there are cookies left from an order, MayaMarie, Missy and Bella will get them. HM: How long do the cookies last? GD: I have to put 30 days because they are food and do not have chemical preservatives in them. That’s why I have to refrigerate them. They will last months in the refrigerator and freezer. I keep some in the refrigerator and freezer and every time you open one of those doors, somepup thinks it’s cookie time. I do keep some of them in a plastic container on the kitchen counter and they have lasted way longer than 3 weeks. But, honestly, in my house, cookies don’t last because my three furry helpers love to eat them. HM: What’s the best way to store them? GD: In the ziplock bag in the refrigerator or freezer. And the pups really like them cold out of the fridge or freezer. HM: Can they be frozen? GD: Yes, we have quite a number of customers that freeze their HH cookies. I was recently informed that a certain husky boy comes running when his mom opens the freezer door, as the thinks it is time for a HH cookie. HM: Are gift certificates available? GD: Yes! That was a popular item during the howlidays (thanks to the suggestion of MFT). HM: Will you bake cookies and send them as gifts? GD: Oh yes. 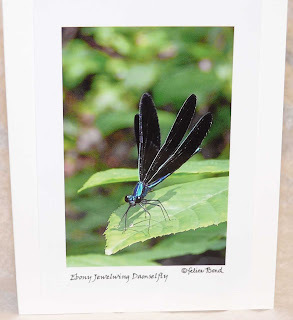 I’ve had quite a few requests for gift orders. Those are the most fun and I do personalize the cookie cake and some very large cookies. HM: Can you include a little gift card from me if I want to send cookies as a gift to somepup or kitty? GD: Most definitely. I create a very cute gift card that I personalize for the sender and I get approval of what you want it to say. I even have paw print stamps so that I can add that personal touch for a kitty or pup. And I always include a special cookie gift with the order. HM: Have you ever sold any cookies for kitties? GD: Not yet. I know Wilbur has eaten the Salmon/Cheddar cookies and his mom said he liked them. HM: Would you be able to adapt them at all for us? GD: I would like to. I have to do some research and see what food stuffs are good for and safe for kitties. HM: Do you make a size cookie that would be good for training purposes? GD: I’m working on that. The problem is finding a small heart shaped cookie cutter that cuts more than one cookie. Something small but tasty. Of course, you would choose the flavor. HM: I’ve also heard that you can make giant cookie cakes! Can you tell me a bit more about those? GD: I call it a “Party Pack” and you will now have a choice of either one 8” cookie cake or two 5” cookie cakes, along with an assortment (about 125) of different heart shaped cookies. I even have little alphabet cookie cutters that I will put a message for that special on the cake or personalize the smaller size cake cookies. HM: And finally, what form of payment do you accept? GD: Right now check or money order. So there you have it folks, an exclusive interview with the lovely Gerri, founder of Happy Hearts Cookies. You can contact her by clicking on the weblink, or you can email her. Don't forget to come back tomorrow for the competition! Today we have a special treat, pups and kitties! 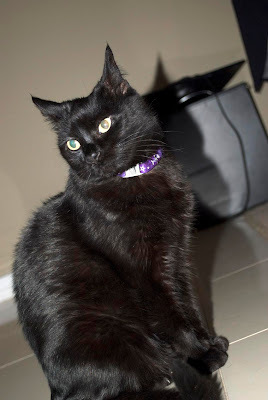 My friend Gerri, who is the owner and chief baker for Happy Hearts Cookies, has agreed to be interviewed right here on Huffle Mawson, Explorer Cat. 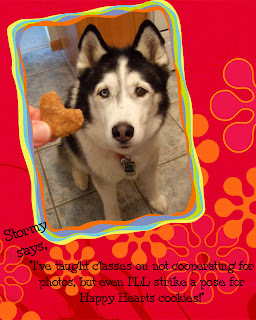 Those of you pups out there who are always looking for good, tasty and healthy treats, keep reading! Gerri is based in Louisiana and ships her cookies all over the USA, and any other countries that will allow processed foods to be sent via airmail. 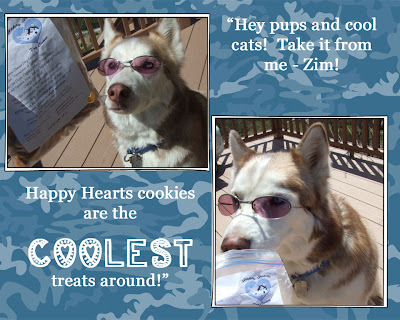 Last year I sent my best friend Zim and his brother and sisters Happy Hearts Cookies for Christmas, and boy were they excited! Anyway without further ado, here is the interview with Gerri. HM is me, GD is Gerri, just in case you were wondering. HM: Tell me a little bit about yourself and your pups, Gerri. GD: A little about me, the dog cookie baker? Well, as you can tell, I love my dogs very much and I like to bake, and I really enjoy creating dog cookies. I’m very fortunate to have a husband that supports this little business venture (which costs more than it makes). I do take care of our household that includes me, hubby, and three dogs. 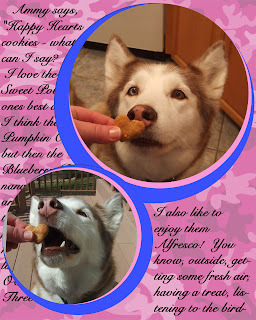 The three pups of this family are MayaMarie, a small Siberian husky with terrible tummy issue, who is the reason for creating the HH dog cookies; Bella, she’s an all white Siberian husky, who is now bigger than MayaMarie, and Missy, my “old girl” who is a shepherd/husky. We live in modest house, and have renovated everything in it ourselves. We even fixed our roof after a storm. 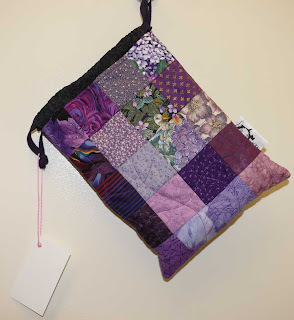 I used to do a lot of crafts and hope to start a couple of projects this summer that should be fun. I used to be legal secretary, but after 30 years, I have resolved to being retired. Hubby is a mechanic and is currently restoring an old Porsche 944. Helping him find parts on eBay has been fun. 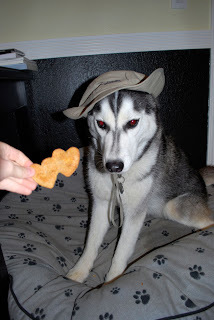 Phantom can't talk - he's too busy eating a Happy Hearts cookie! HM: Why did you start Happy Hearts Cookies? GD: Because MayaMarie has such terrible tummy issues. She can not eat processed dog food, so I have to cook for her and I felt so bad that she could not have any treats. Since I like to bake, I decided to make her some cookies. I did research on flours, fruits, and all sorts of ingredients. She has never complained. She has a serious sweet potato addiction and when I cook the sweet potato to prepare it to make sweet potato cookies she will sit and watch it cook and woo woo to it. Of course when it’s done, I have to cut a piece off and let it cool so she can taste it before it goes in my cookie mix. HM: What’s so good about Happy Hearts? GD: I’m gonna be bold and say because I make them. They taste good and are made in my kitchen by me only. A lot of personal time goes into every batch of cookies. HM: Why are you different to other dog cookie companies? GD: I use fresh, healthy ingredients that I use for my own dogs and myself. I take the time to ask if your dog is allergic to something and I will change up the recipe. I even do “special request” recipes. My quality control is controlled by me, personally. I actually taste whatever ingredients I use and the finished product has to be liked by me and my three taste testers. And to make an order even more fun, you always get a free bag of fun shapes with every order. HM: Do you have government approval and all that formal stuff? GD: Oh yes! I actually send my cookies to the LA Dept of Agriculture and have the lab analysis done. Once I get that info back (takes about a month) I send in the proper paperwork to another section of the Dept of Agriculture to have that cookie registered. I even have a manufacturer number. I just got in my paperwork to renew my license and my current menu of cookies. I’m actually legal too! I’m incorporated and pay taxes. HH could use a good bookkeeper, file clerk and paper shredder, so if any pup or kitty out there wants to work for cookies, I’m interested. HM: I have a friend whose dog has food allergies. Are you able to help out pups with that problem? GD: Most definitely. That seems to be my most requested service. Tell me what you can and cannot have and I’ll create a dog cookie for you. I'm always creating new recipes so all you have to do is ask. Steve and Kat always sit pretty for Happy Hearts cookies! Well, pups and kitties, that's not all. Tune in tomorrow for part two of the interview, and on Thursday for a special competition. And don't forget to visit Happy Hearts Cookies! Or you can email Gerri direct if you have any questions. 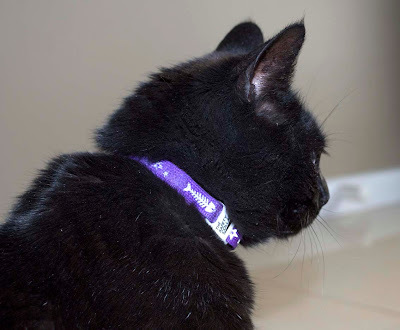 Some of you have been asking about my lovely purple collar, so here is a close up shot of it for you. It has fishes on it that are reflective, so they glow when mum uses the flashy beast or if I ever get out the front door and in some car headlights (I haven't made it very far out the front door yet but I just KNOW there is something good out there I need to explore. I definitely haven't run out in front of any cars, so don't worry). This is my corner of the kitchen where I get to eat. I have three bowls all to myself. The silver one holds my dry foods, and I will not eat out of it if I can see the bottom of the bowl. I yell at dad to fill it up if that happens. The pink bowl holds my Fancy Feast, and there are three different bowls that get used for the Feast each night on a rotating basis. 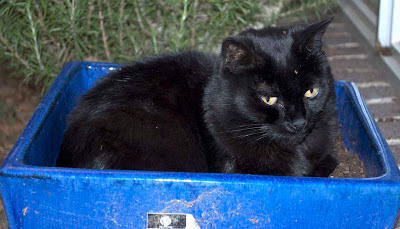 The blue bowl you see behind it is my water bowl. Back in the days when poo-face Salvador was around, I had to eat in a different part of the house. If dad fed us together Salvador would chase me away and then eat my dinner. So dad started feeding me in the garage and would stand and watch me to make sure poo-face didn't come and steal my food. Since he went to the bridge I can eat in the kitchen again, but sometimes I look around just to make sure he isn't hanging around getting ready to steal my dinner. I decided for a change to pose for a photo. This way, you can see my newest favourite spot to sit, behind dad's chair at his computer. It makes sure he doesn't forget about me. See that container behind me? That's some of my food. It's in the living room because mum used the container to prop the door open one day, and she's never moved it since. Talk about lazy!